Pop Up Piano makes it appearance for the second time in Miami. If you are walking around Art Basel you are probably going to notice these ornately painted pianos. None of them are painted the same, yet they are all part of an exciting art event playing out at Art Basel Miami for the second year. It's called Pop Up Piano -- a public arts project put together by Steinway and Sons Miami. The project first appeared at Art Basel last year. In the vein of full disclosure, WLRN's social media guru, Daniel Rivero, is one of brains behind this operation. He has done a great job making sure all of you know this is going on, as well as the rest of the art world. Eight pianos donated by Steinway & Sons Miami will be strategically placed across Wynwood, Midtown Miami, Downtown Miami, and Design District areas. Each piano will be crafted by eight artists. Art Basel week spectators will have access to tickle the ivories between three scheduled “pop-up” performances by talented musicians. 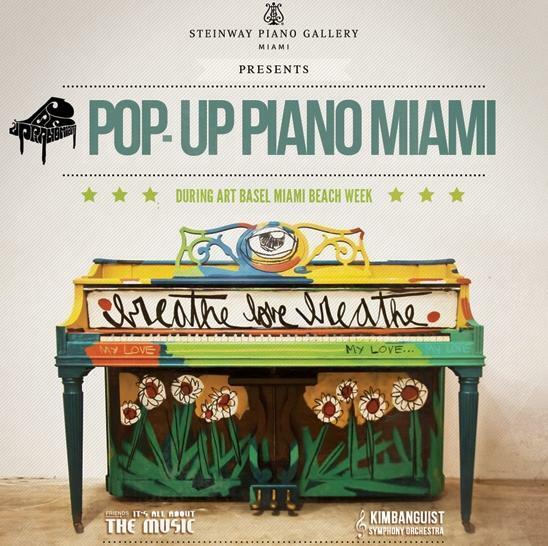 After Art Basel Miami Beach week, the pianos will be donated to local charities. PUPM will also work to expand and implement specially designed music programs and workshops at some of the charities where the pianos will permanently reside. Additionally, this year PUPM will benefit Friends of the New World Symphony and the Kimbanguist Symphony Orchestra, Central Africa’s only symphony through a special fundraising concert event that will feature two legendary musicians. If you want to see what the Twittersphere is saying about Pop Up Piano, or if you want to tweet about it, use #pupm.